This report provides a snapshot of posting activity on the Steem Blockchain over a 7 day period. How much is paid out on posts? What groups are getting the payouts? Total number of posts is comparable to last week which is a good sign. Posts are down slightly but Steemians are still posting despite the reduced rewards. The distribution to individual accounts was flatter last week than the week before but we have one large outlier. One poster is getting almost 4 times as much as the next in terms of payouts in a week. The aggregate payouts in the week are also down. This is driven by the Steem Price. 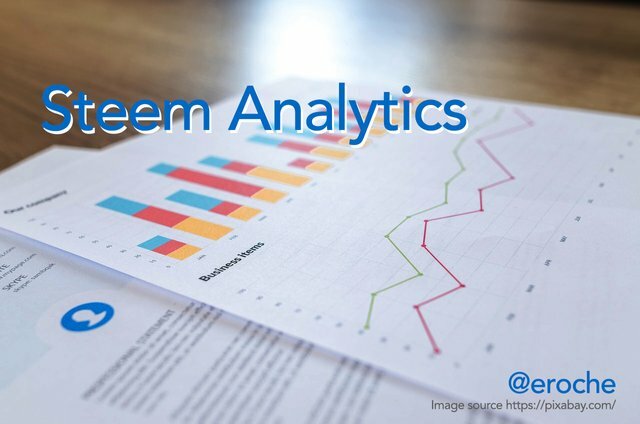 Remember a fixed amount of Steem is produced each week but the value (in dollars) varies as the price fluctuates. This report is divided into 3 sections. 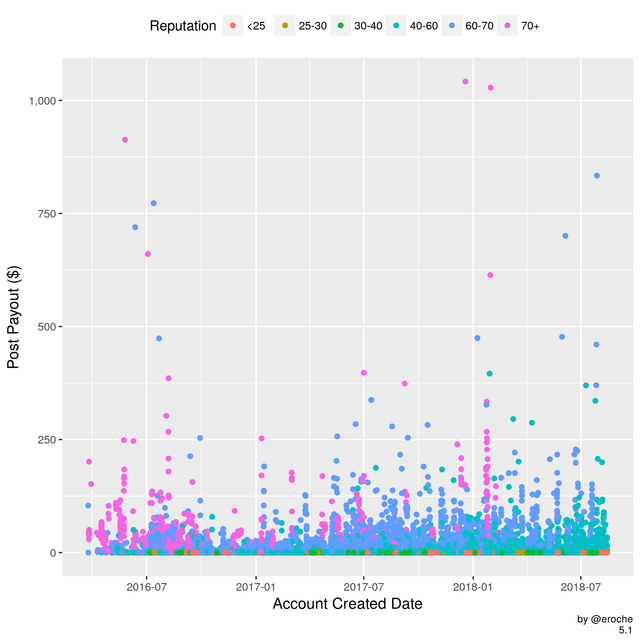 In the first section we analyse individual post payouts in detail. In the second section we take a weekly view focusing on the relationship between different types of authors. 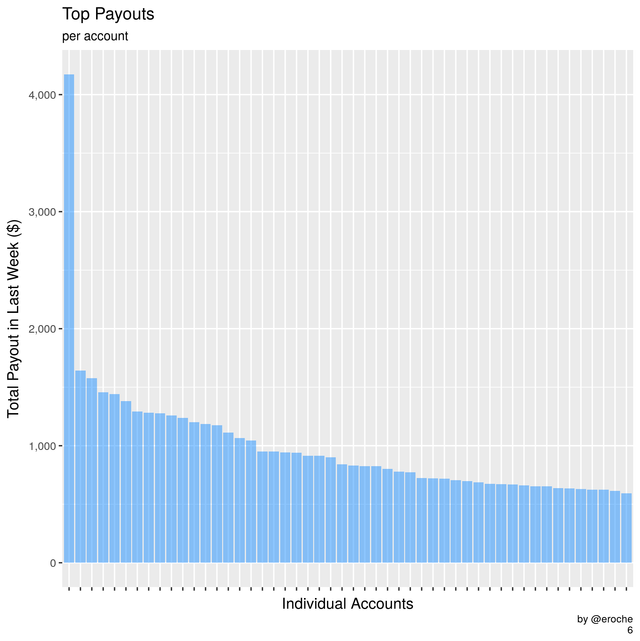 The final section looks at the top 50 payouts by individual account. Over this 7 day period there was a total pending payout of 295k $ (as of yesterday). 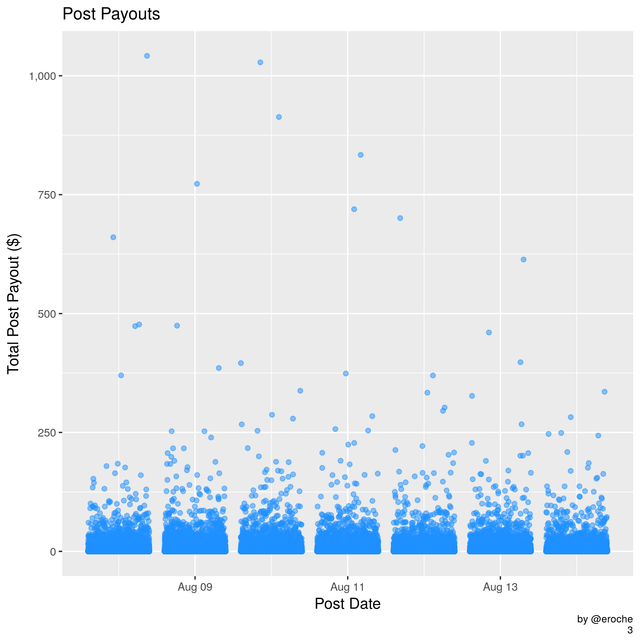 The median payout per post is 0.03 $. The next graphs shows the breakdown of these figures on a daily basis. 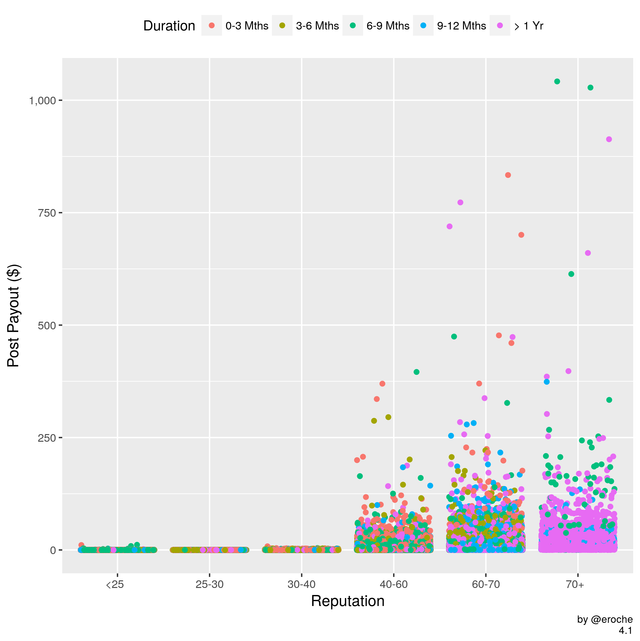 As can be seen from the difference between the median and the mean post payout there are some large outliers. 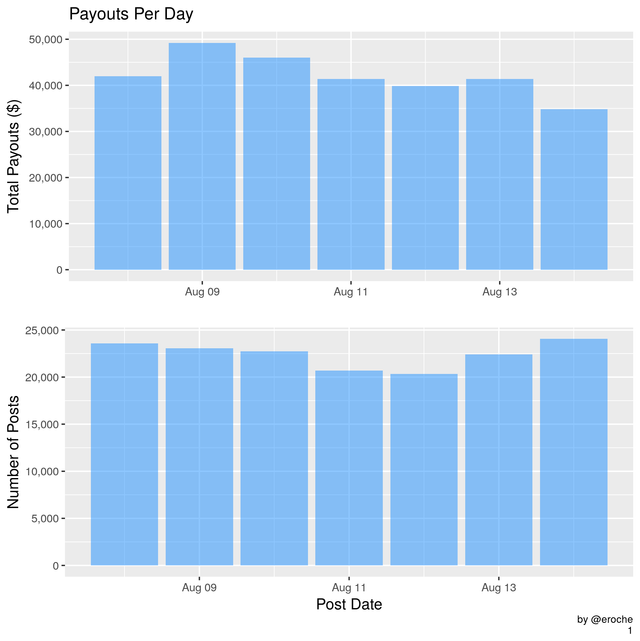 This next graph shows the payout on individual posts for each of the last 7 days. 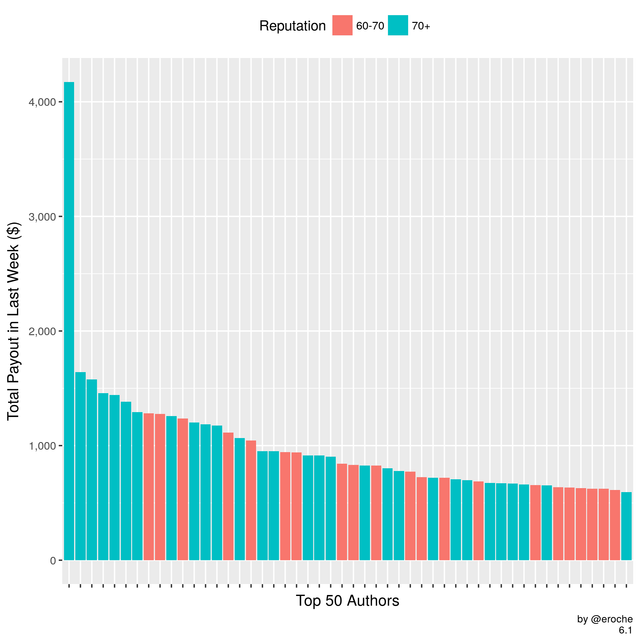 Daily totals give a high level overview but we can examine subdivisions or groups of authors to get further insights into who getting the posting rewards, and who is posting. The colour in the following graphs represent different cohorts of Steemit Accounts. This highlights activity on these different groups of accounts. 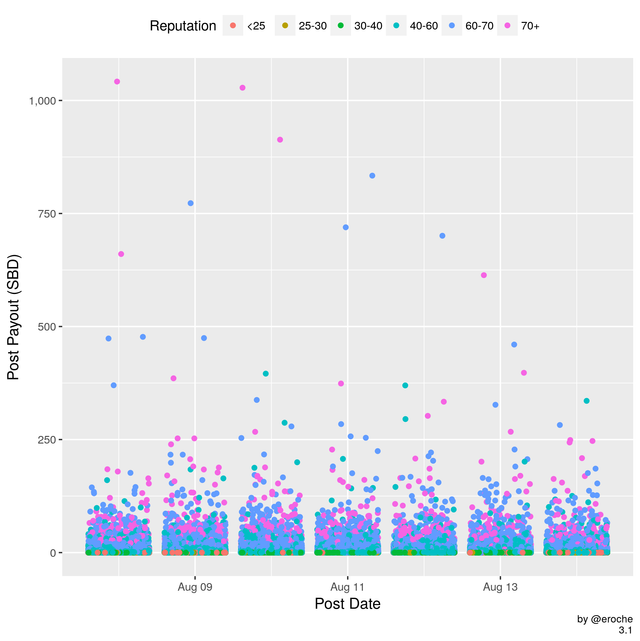 How much are posts making each day for people of different Reputations? How much are posts making each day for people with different levels of Steem Power? The first accounts were created in April 2016. We are now past the 1m account mark. Absolute number is important but retention is also important. * How many people who joined over the course of the last year are still posting? * Who is creating the bulk of the daily content? How much are posts making each day for people that have been on Steem/it for different lengths of time? How much are automated posts making each day? 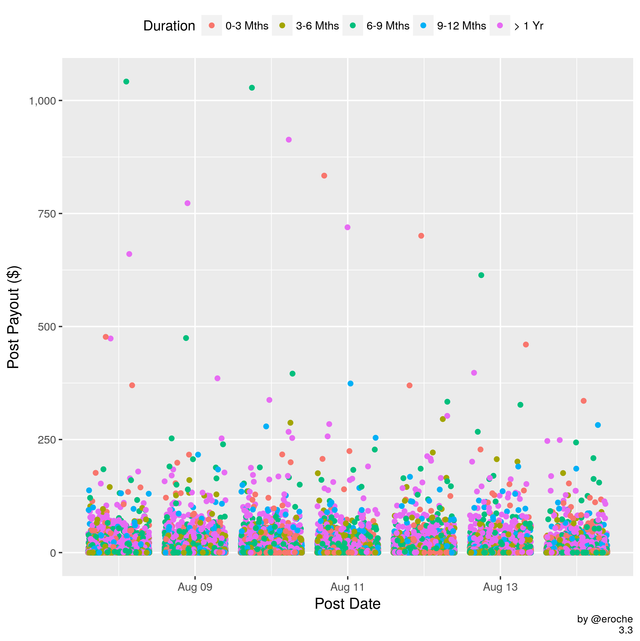 It is useful to look at numbers of posts on a daily basis but aggregating over a longer period gives us additional insights. 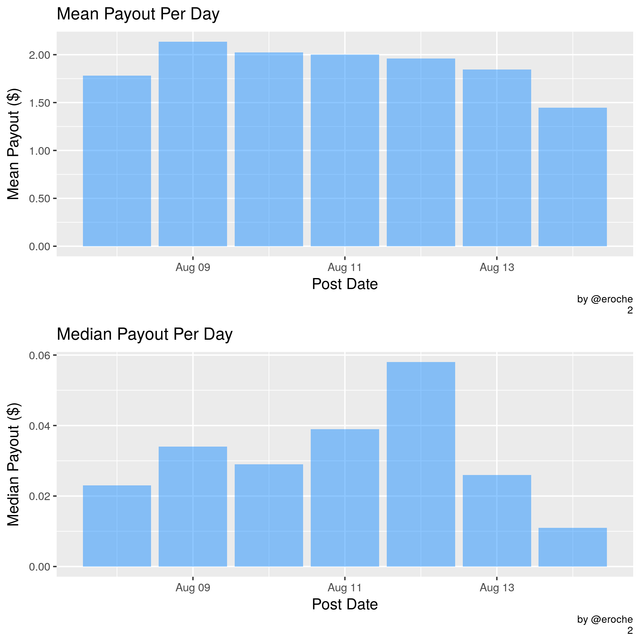 In the second section we take a weekly view of post payouts with the aim of identifying different cohorts of posters over the week. Let's examine the breakdown of the weekly post payouts by the categories we have looked at before. We can also split the data slightly differently to look at these features. 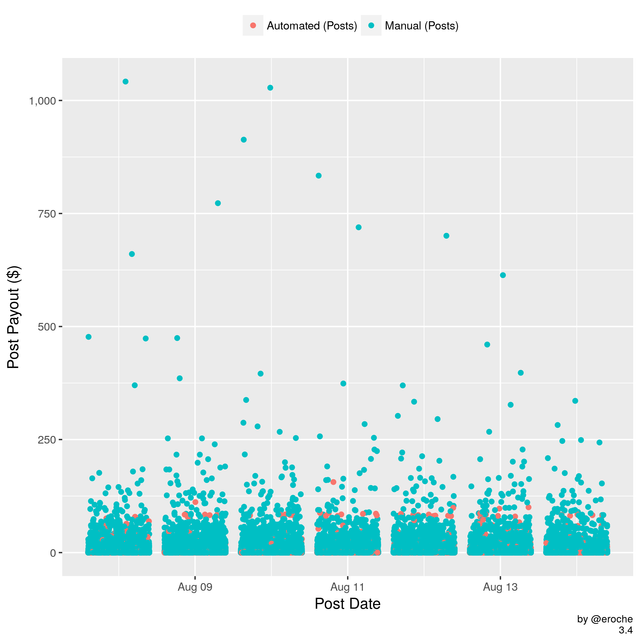 The remaining graphs in this section look at Posting Activity with account Creation Date Plotted on the x axis. In this third and final section we look at aggregate payouts over the week on individual accounts. The top few posters really skew this image. Lets look in more detail by highlighting the authors of the different categories we have looked at before. Is it when you type an address or select a place from the map or list view? Thanks for reporting this. I'll check it out. There is an updated version of the app on the play store with this issue fixed. Thanks again for pointing it out.